Need a business space for your company in Ocala Florida? We can help! If you are looking for a commerce, business or industrial lot in a thriving area, then look no further. Our expertise, direct pricing, and local knowledge is a key edge for any investor or buyer. 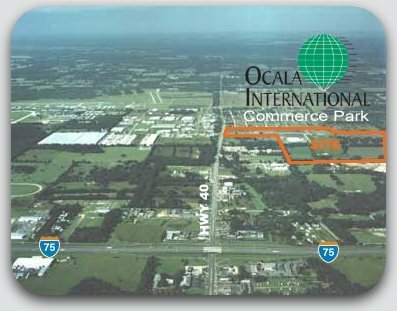 We have prime lots for sale in the Ocala International Commerce Park, which is strategically located 5 minutes from Ocala International Airport and I-75. This proximity to quick and efficient distribution and travel is a key benefit for any company. In addition, the talented and loyal workforce emerging out of the nearby University of Florida can help fuel your growing enterprise for years to come. Ocala is one of Florida's fastest growing areas, and the land you invest in here may be one of the best business decisions you'll ever make. Prime commerce lots are still available!